Snappy Tomato Pizza is a franchise business, where all stores are owned and operated by independent Snappy Tomato Pizza franchisees. Each Franchisee is independently responsible for its own legal and regulatory compliance and for the operation of its own Snappy Tomato Pizza store(s) and for all compliance arising from any transactions with you, any products ordered by you from our Sites and any products ordered from our Stores. We obviously need details such as your name, address, contact number and email address to enable us to fulfil your order requests. We have done our best to keep this information to a minimum and there is some information such as your date of birth that is entirely optional. We will only use your date of birth to send you birthday greetings and any related special offers. To complete your registration we will send an email message to the email address you have entered on your account details to activate your account so please ensure that you enter your email address correctly. This is important so we can let you know that your order has been received and accepted by your local store. You will also receive emails to let you know that your 'order is on its way' or is 'ready for collection' When you register you will also have the option to accept future emails to keep you informed of your reward points balance and information about special offers and deals. See our Direct Marketing Policy for more information. Personal information such as your name, address, telephone number and email address as provided by you when you register or place an order on our sites. Our sites are protected with SSL (Secure Sockets Layer) which is the standard security technology for establishing an encrypted link between our sites and your device browser. This means that all data passed between our sites and your device browser remains private and integral. You can check that this Secure Encryption function is operating when you are connected to our sites as you will you will see the padlock symbol in the address bar on your device browser. This padlock symbol indicates a secure web transaction. for processing your order and answering your queries - We collect this information and share it with our Stores to process your order. If you fail to provide us with the information that we request, then you may not be able to place an order via our Sites. We have a legitimate interest to collect this information: to process your order and provide our services to you. We will store your details for 24 months from the date of your last order. You can change your account settings at any time. If you wish to do so, please login to your account and follow the instructions provided. for product development - for statistical, market research, testing and survey purposes, to notify you about changes to our Sites or our services. We have a legitimate interest to collect this information: to continue to improve the services we and our Franchisees provide to you. We will store your details for 24 months from the date of your last order. You can change your account settings at any time. If you wish to do so, please login to your account and follow the instructions provided. The only information that is stored by NetPay is in relation to the transactions themselves so no customer database is created within the NetPay system. There is, therefore, no relation or connection to customer data held on the Snappy Tomato Pizza website. The NetPay servers on which your card details are stored are Level 1, PCI Compliant, tested and audited regularly. We also include the PayPal option for payment of online orders. When you select ‘PayPal Express Checkout’ in the Checkout Process you will be taken to the PayPal payments system. PayPal do not store Debit or Credit Card details nor do they share customer details with any third parties. We may retain copies of any correspondence you send us and we will keep your registration and order details to enable you to access your account easily and so you can use the re-order previous orders facility. We promise that we will never share, divulge or sell your information to any third party and all information will be held on our Dedicated, Secure Web Server. 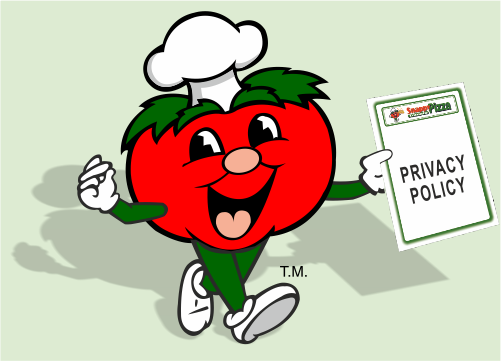 We only share your information with our Snappy Tomato PIzza Franchisees. Occasionally, we made need to access information in conjunction with companies we contract with to carry out improvements to our operation which may include; assisting us to more effectively fulfil orders; managing and conducting marketing; providing technical assistance and support. However, those companies will only be permitted to use your personal information for the purpose of performing that particular function strictly in accordance with our instructions and not for any other purpose. All information you provide to us is stored on our secure dedicated server. In order to prevent unauthorised access or disclosure, we use the services of Namesco, part of the DADA Group which is one of the leading names in the European Domain & Hosting segment and ranking among the top groups in all geographies in which the Group operates. Our Dedicated Server is hosted, located and maintained in the UK and is protected by state of the art physical, electronic and corporate policies to safeguard and secure the information we receive. Once we have received your information, we use strict procedures and security features to prevent unauthorised access. All information you provide to us is stored on our secure servers. In order to prevent unauthorised access or disclosure, we have put in place suitable physical, electronic and corporate policies to safeguard and secure the information we receive. Please keep your password secure - We will never telephone you to ask for any personal information you have given online. We recommend that you also regularly change your password to maintain the security of your online account. If you've forgotten your password, you will need to 'Reset your Password'. Select the 'Forgot your Password' link on the Sign In page and enter your email address on the 'RESET YOUR PASSWORD' page and we'll send you an email. Simply follow the instructions in the email to change your password. Phishing is the name given to attempts to steal personal details and financial account details from a website user. We will never ask you to reveal your password so if you receive any email or are asked for your password by anyone claiming to work for us, please report the incident on our Contact Us link or email us at stponline@snappytomatopizza.co.uk or write to us at Snappy Tomato Pizza Ltd, 91 Heming Road, Redditch, Worcestershire. B98 0EA. You may request details of personal information which we hold about you under Data Protection regulations. A small fee will be payable. If you would like a copy of the information held on you, please contact us using our Contact Us link or email us at stponline@snappytomatopizza.co.uk or write to us at Snappy Tomato Pizza Ltd, 91 Heming Road, Redditch, Worcestershire. B98 0EA. Please note that we are unable to give you any details of information held by any of our Franchisees as we do not have access to this information. To obtain a copy of any information held by a Franchisee, please contact your local Store. We may link to other websites which are not within our control, e.g. for information about ingredients and allergens. Once you have left our Sites, we cannot be responsible for the protection and privacy of any information which you provide. You should exercise caution and look at the privacy statement applicable to the website in question. You can use our Contact Us link or email us at stponline@snappytomatopizza.co.uk or write to us at Snappy Tomato Pizza Ltd, 91 Heming Road, Redditch, Worcestershire. B98 0EA.